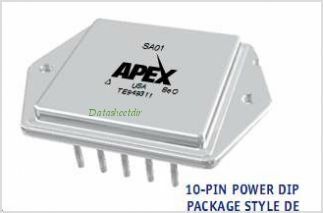 The SA01 ampliier is a pulse width modulation ampliier that CAN supply 2KW to the load. The full bridge output ampliier CAN be operated from a single power supply over a wide range of voltages. 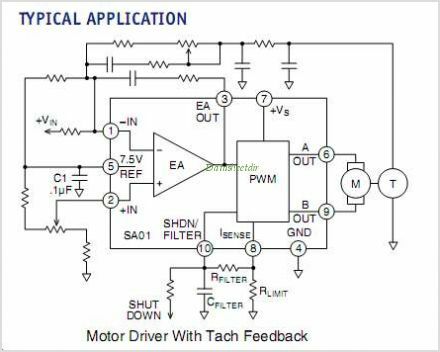 An error ampliier is included which CAN provide gain for the velocity control loop in brush type Motor Control applications. Current limit is programmable by a single resistor. A shutdown input turns off all four drivers of the H bridge output. A precision reference output is provided for use in offsetting the error ampliier. The error ampliier CAN then be scaled for standard input signals. The ampliier is protected from shorts to supply or ground. The H bridge output MOSFETs are protected from thermal overloads by directly sensing the temperature of the die. The 10-pin hermetic power package occupies only 2 square inches of board space and is isolated. By Cirrus Logic, Inc. This is one package pinout of SA01,If you need more pinouts please download SA01's pdf datasheet. This is one application circuit of SA01,If you need more circuits,please download SA01's pdf datasheet.